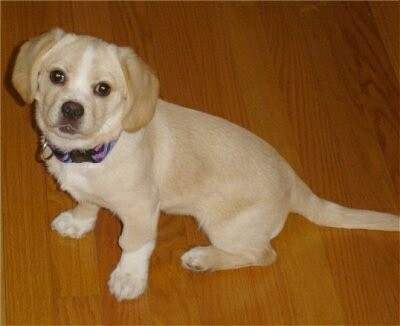 Penny the Peagle (Beagle / Peke mix breed dog) at 6 years old—hHer mom is a Beagle and her dad is a Pekingese. The Peagle is not a purebred dog. 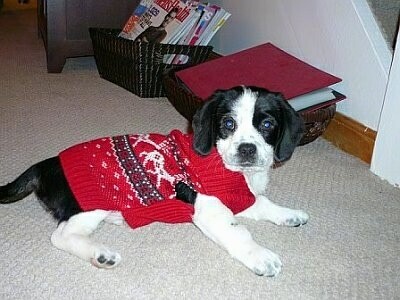 It is a cross between the Beagle and the Pekingese. The best way to determine the temperament of a mixed breed is to look up all breeds in the cross and know you can get any combination of any of the characteristics found in either breed. Not all of these designer hybrid dogs being bred are 50% purebred to 50% purebred. It is very common for breeders to breed multi-generation crosses. 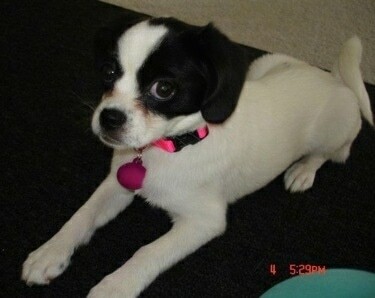 "This is Izzy, my Peagle at about 11 months old. She weighs 13 pounds. She is a joy to be around. She loves to be right in the center of everything. If she is not around all the action, she will let you know how she feels. She loves to sleep under the covers in the bed, and often snuggles right up with me when she sleeps. I have tried to move her in the middle of the night, but she will go back to where she was before. Izzy loves to go on walks or to be outside. She goes on 3 walks a day, one at the crack of dawn, one in the afternoon, and one at evening. She is very friendly around other dogs and humans. Izzy does not go somewhere without finding a friend. She attends Doggy Daycare every Saturday at our local PetSmart. Every employee knows Izzy by name. Upon walking through the front doors, Izzy knows her way to the section where the daycare is located. Izzy is a very smart dog. She has learned how to open security gates that we had placed around the house. Izzy is a joy to be around!" 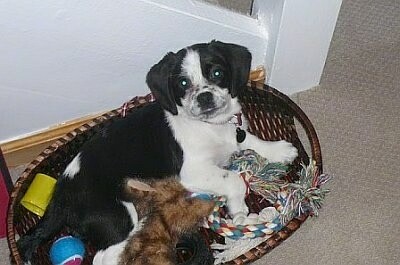 Milo the Peagle puppy (Beagle / Pekingese mix breed dog) at 3 months old, "Taking some time to hang out with his toys." 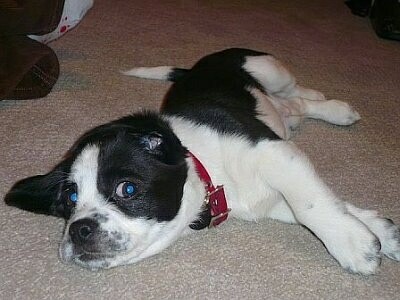 Milo the Peagle puppy (Beagle / Pekingese mix breed dog) at 3 months old, "Relaxing…not a worry in the world!"